Download "Queensland Education Performance Review"
1 Queensland Education Performance Review Government to the Report of the Queensland Education Performance Review Masters Review A Shared Challenge: Improving Literacy, Numeracy and Science Learning in Queensland Primary Schools Overview On 1 May 2009, Professor Geoff Masters of the Australian Council for Educational Research presented the report of the Queensland Education Performance Review to the Premier and to the Minister for Education and Training. 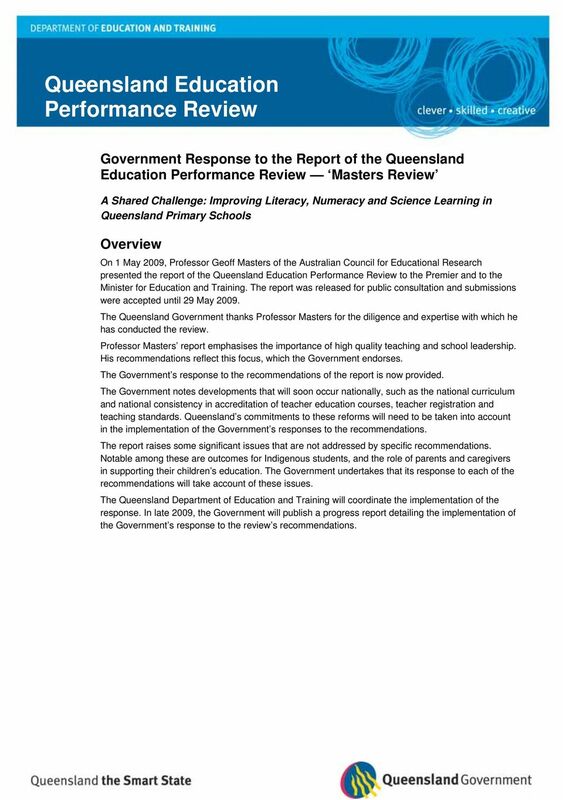 The report was released for public consultation and submissions were accepted until 29 May The Queensland Government thanks Professor Masters for the diligence and expertise with which he has conducted the review. Professor Masters report emphasises the importance of high quality teaching and school leadership. His recommendations reflect this focus, which the Government endorses. 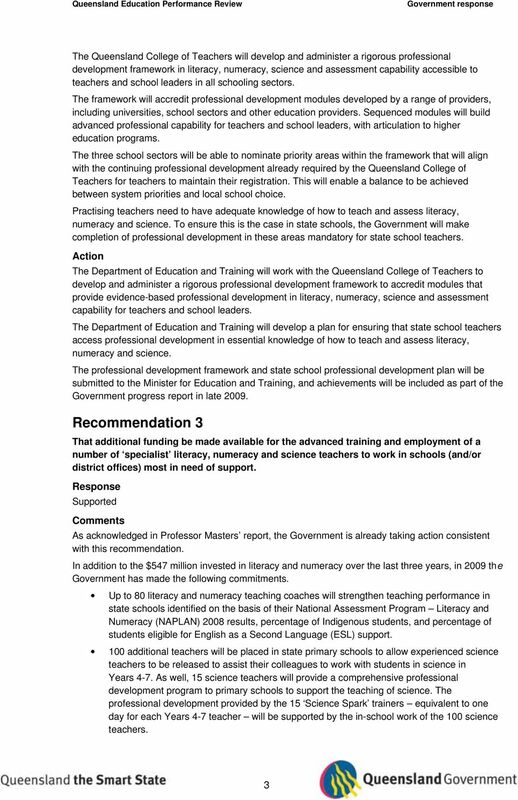 The Government s response to the recommendations of the report is now provided. 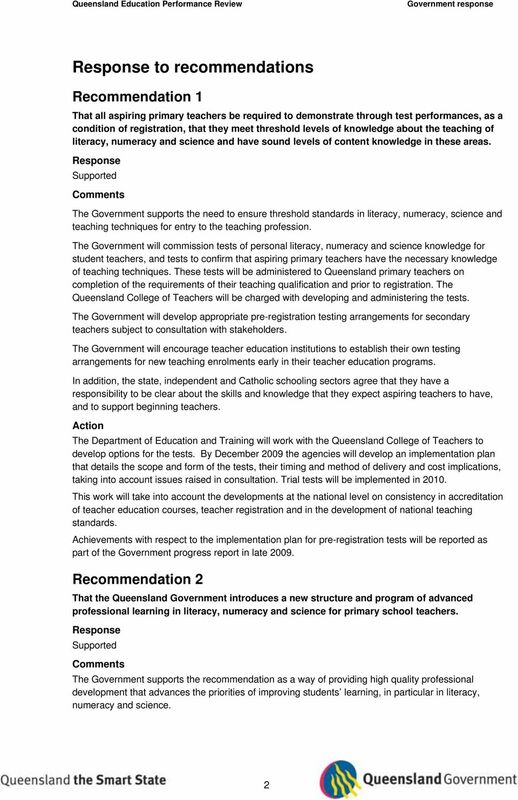 The Government notes developments that will soon occur nationally, such as the national curriculum and national consistency in accreditation of teacher education courses, teacher registration and teaching standards. 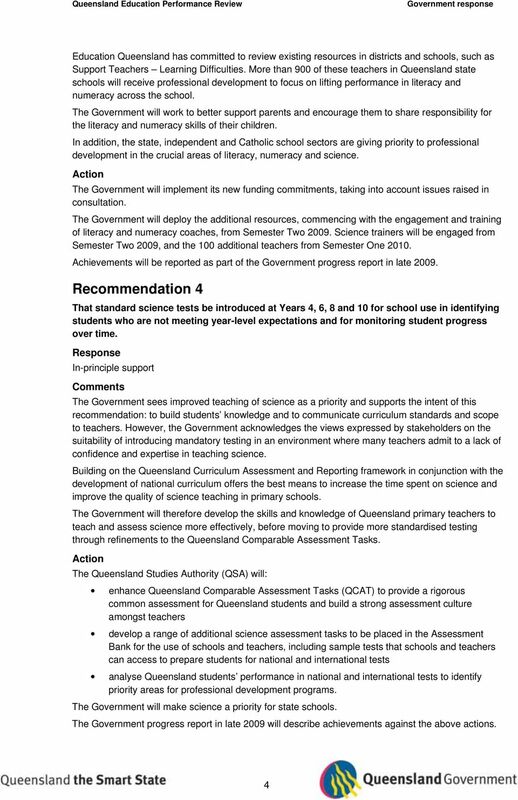 Queensland s commitments to these reforms will need to be taken into account in the implementation of the Government s responses to the recommendations. The report raises some significant issues that are not addressed by specific recommendations. Notable among these are outcomes for Indigenous students, and the role of parents and caregivers in supporting their children s education. The Government undertakes that its response to each of the recommendations will take account of these issues. 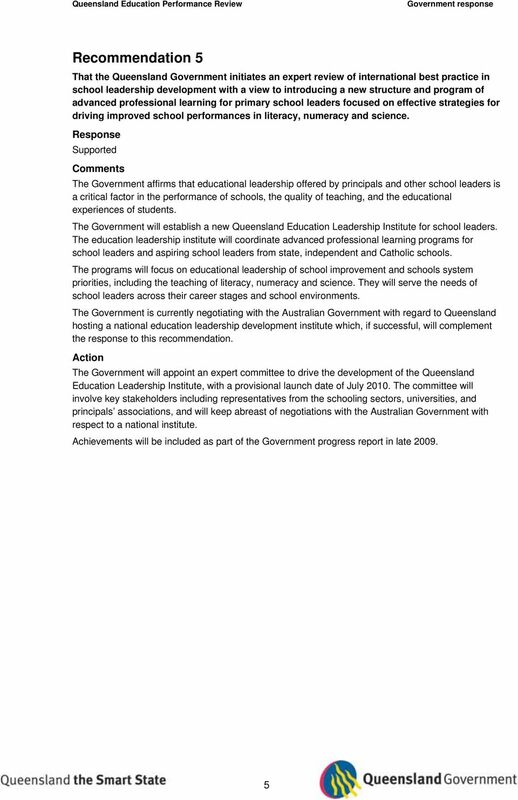 The Queensland Department of Education and Training will coordinate the implementation of the response. 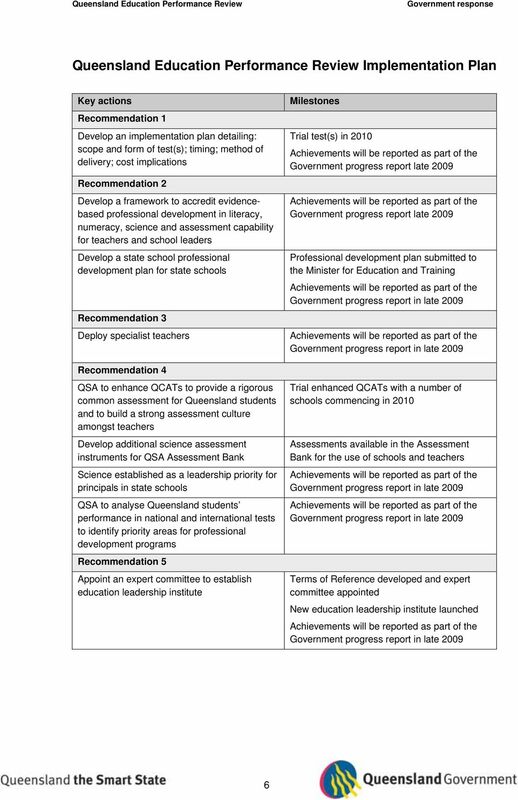 In late 2009, the Government will publish a progress report detailing the implementation of the Government s response to the review s recommendations. About Next Generation Principal This Australian Primary Principals Association principal preparation initiative is aimed at developing leaders for the challenges of school principalship into the future. Introduction ASIC s provides educators with the knowledge, skills, strategies and teaching materials to teach consumer and financial literacy. It comprises two free modules for primary and secondary educators.